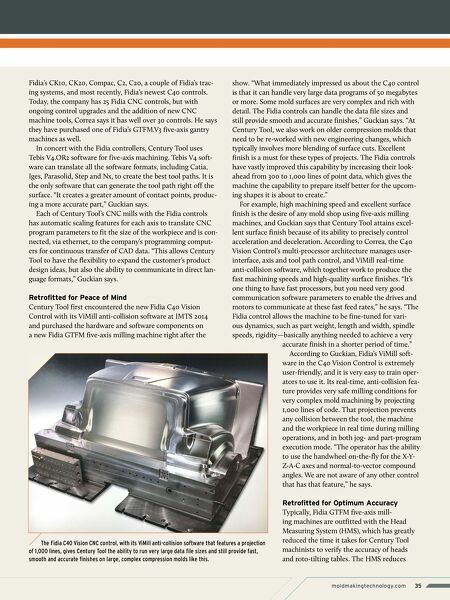 Case Study / Machining 34 MoldMaking Technology —— OCTOBER 2017 Retrofitting and Updating CNC Controls Keeps Milling Capabilities on Cutting Edge In 1987, Century Tool and Gage Company (Fenton, Michigan) bought its first Heyligenstaedt vertical mill with the first Fidia CNC control system that was available in North America. Mickey Guckian, manufacturing manager of programming for Century Tool, was there. "I remember when we purchased the first Fidia control. It was installed on a two-spindle Heyligenstaedt vertical mill. I was running that machine at the time," he says. "The new control had dual eight-inch floppy drives, which was unique back then, and it gave us the abil- ity to greatly improve the feed rate for the complex milling routines we were running for the large compression molds we were manufacturing." According to Kevin Cummings, the company's vice presi- dent, Century Tool was founded in 1974 and has experienced consistent growth over most of its history. This is due, in part, to expanding the manufacturing of composite compression molds to produce SMC, RIM and urethane parts for various sectors of the transportation industry. The company specializ- es in compression molded, exterior Class A and reinforcement panels for truck and trim applications. It also makes 75 percent of the exterior body panel molds. "We have become a major builder of molds and secondary tooling for the automotive, heavy truck, aerospace and personal watercraft industries," Cummings says. With that growth came the company's move to a new, 125,000-square-foot facility that is capable of han- dling 60-ton machine block sizes that are as wide as 100 inches and as long as 300 inches. The plant is equipped with four, five-axis CNC machining centers, seven heavy-duty vertical and horizontal machines, three CNC heavy-duty multi-spindle traveling column gundrills, 29 CAD/CAM workstations, and a try-out press facility with capacities of 500, 600, 1,500 and 3,000 tons. "Before Fidia started developing a complete line of five-axis milling machines, they were building CNC controls," Mickey Guckian says. "Dr. Giuseppe Morfino, Fidia CEO, was the young controls engineer that started it all, and he has been the guiding influence in the CNC machine control design that has played a significant role in making Century Tool and Gage a manufacturing and production success. All of our milling machines are CNC programmable and use Fidia controllers for high-level accuracy, dependability and productivity." Retrofitted for State-of-the-Art Productivity Jorge Correa, Fidia's vice president of sales in North America, says, "Century Tool is a great example of what can be done with control retrofits to bring existing CNC machine tools to state-of-the-art levels." Since 1987, Century Tool has used Images courtesy of Century Tool and Gage Co. This Fidia C40 Vision CNC control's multi-processor architecture manages the user-interface, axis and tool path control and ViMill real-time anti-collision software, which together work to produce the fast machining speeds and high- quality surface finishes. Here, Doug Michael, Fidia service manager, demon- strates the control's capabilities. CENTURY TOOL AND GAGE COMPANY PROBLEM: Struggled to achieve higher feed rates and accuracy for complex milling of large compression molds. 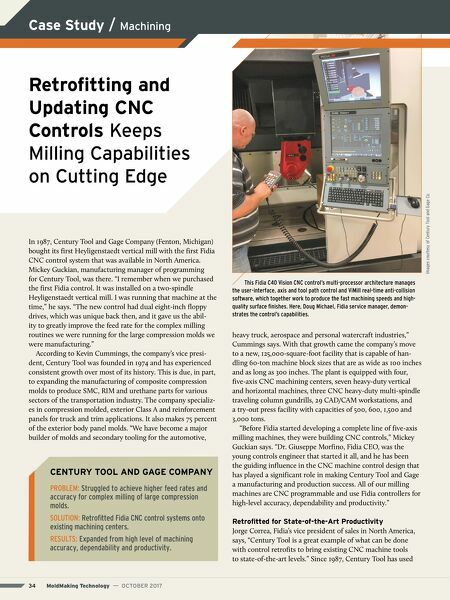 SOLUTION: Retrofitted Fidia CNC control systems onto existing machining centers. RESULTS: Expanded from high level of machining accuracy, dependability and productivity.